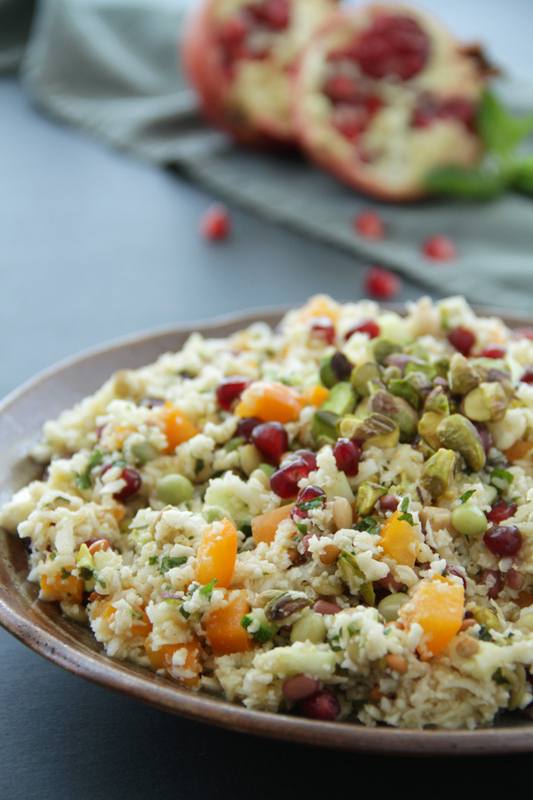 Anyone who has a healthy appetite will quite enjoy this vibrant salad. 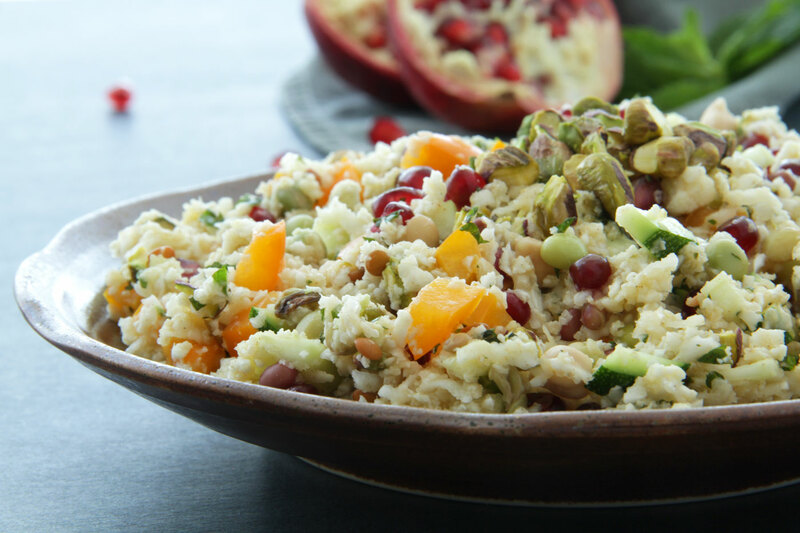 We have mixed a riced cauliflower together with sprouted beans,pomegranate seeds and chopped up fresh veggies to create a healthy, protein packed dish that will not only satisfy your hunger but also keep any sweet cravings at bay. Oh, but wait, there’s more. 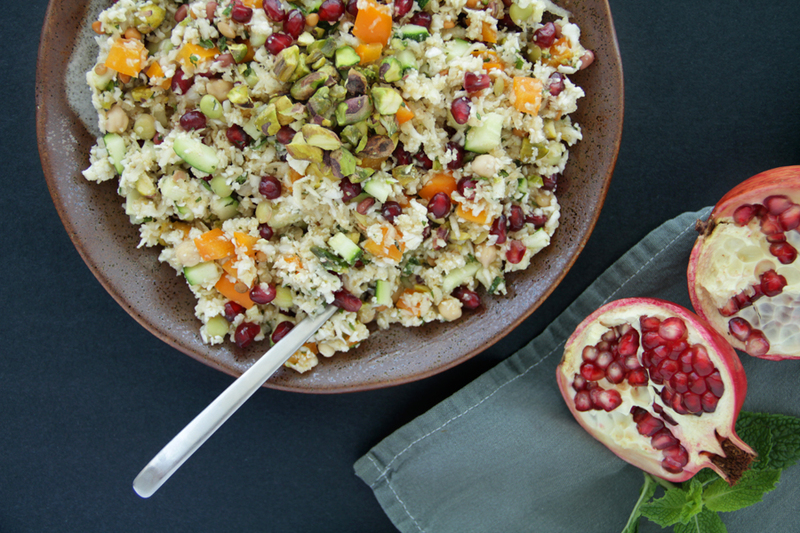 The dressing that gets poured over this powerful combination of veggies is a Moroccan blend of spices, fresh citrus juice and hempseed oil; such a nourishing combination! Hempseed oil, in particular, is known for having the right balance of omega-3 and omega-6 fatty acids, which is quite important, especially for vegans and vegetarians! Hemp oil or hempseed oil is the nutty, flavourful oil that comes from the raw seeds of the hemp plant, however, it does not contain THC – the primary psychoactive compound in marijuana.While the oil posses virtually no psychoactive elements, consuming hemp oil is still considered bit weird to some. This oil however is a great source of high-quality nutrients and has a long history of use in Eastern culture as a multi-purpose natural remedy. Hemp seed oil has a 3:1 ratio of Omega-6 to Omega-3 fatty acids, a balance that has been shown to support heart health as well as help the body balance hormones. Hemp oil is also a great source of linolic acid, an omega 6 fatty acid that reduces inflammation and aids in acne treatment. Hemp seed oil contains ceramides, these are lipids (fats) that support cellular membranes. Cellular membranes are the gates that allow substances to exit or enter a cell. In hair, ceramides help prevent excess moisture from leaving the cells. Not only does hemp contain a wealth of healthy fats, but it also is a rich source of vitamin E. Vitamin E is an antioxidant essential for skin and overall health. Pretty cool, eh? 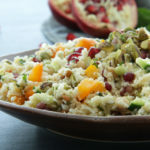 Raw cauliflower is grated into a fine “rice” and tossed with pomegranate, sprouted beans, zucchini pepper and mint and dressed in zesty hemp oil sauce. Cut the stalk off the cauliflower and discard the leaves. Roughly chop it up and place it into the food processor and mix for 20 seconds into a rice like consistency (alternately, use a hand grader). Transfer to a bowl and add washed bean/lentil sprouts, chopped bell peppep,zuchinni pomegranate seeds and chopped mint leaves. In a separate small bowl, mix all the ingredients for dressing. Pour the dressing over salad and stir well. Chill for at least 1 hour to let the flavors combine.